There's no problem in our house right now with getting our son to make anything crafty. Give him a piece of wood (as I did the other day) and an hour later he has glued things to it, painted it, and reshaped it to create a space ship. It didn't look like a space ship to me, but to him it was - and that's all that mattered. 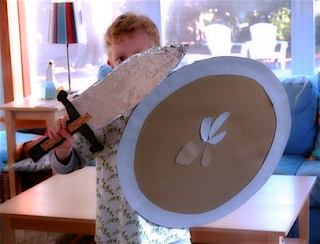 However, if you find your little guy just not interested in crafts then there's always a great way to try and get them interested: try a sword and shield or a spaceship. You don't need much to create a real work of art, and the process is a great way of building curiosity. I got the idea of the sword and shield from Blair at WiseCraft who was only too happy to get her little guy interested. As you can see from the image above, he's quite proud. Now that's progress! I can just imagine my son embellishing the sword with all sorts of designs. There's always a good book at the library to help you, or you can just use your imagination. Some recycled cardboard, some foil, a bit of paint or crayons. I think I'll try this one with my son. It's an hour well spent.